In some areas of the Mediterranean basin where the understory stratum represents a critical fire hazard, managing the canopy cover to control the understory shrubby vegetation is an ecological alternative to the current mechanical management techniques. In this study, we determine the relationship between the overstory basal area and the cover of the understory shrubby vegetation for different dominant canopy species (Pinaceae and Fagaceae species) along a wide altitudinal gradient in the province of Catalonia (Spain). Analyses were conducted using data from the Spanish National Forest Inventory. At the regional scale, when all stands are analysed together, a strong negative relationship between mean shrub cover and site elevation was found. Among the Pinaceae species, we found fairly good relationships between stand basal area and the maximum development of the shrub stratum for species located at intermediate elevations (Pinus nigra, Pinus sylvestris). However, at the extremes of the elevation-climatic gradient (Pinus halepensis and Pinus uncinata stands), stand basal area explained very little of the shrub cover variation probably because microsite and topographic factors override its effect. Among the Fagaceae species, a negative relationship between basal area and the maximum development of the shrub stratum was found in Quercus humilis and Fagus sylvatica dominated stands but not in Quercus ilex. This can be due to the particular canopy structure and management history of Q. ilex stands. In conclusion, our study revealed a marked effect of the tree layer composition and the environment on the relationship between the development of the understory and overstory tree structure. More fine-grained studies are needed to provide forest managers with more detailed information about the relationship between these two forest strata. 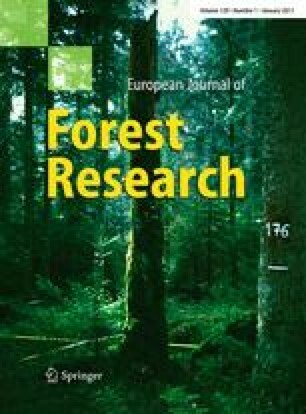 This article originates from the final conference of the Cost action E47 “European Network for Forest Vegetation Management: Towards Environmental Sustainability” in Vejle, Denmark, 4–7 May 2009. This study was partially funded by the project Consolider-Ingenio Montes CSD2008-00040. Lluís Coll and José Ramón González were, respectively, supported by a ‘Ramón y Cajal’ and a ‘Juan de la Cierva’ contract from the Spanish Ministry of Science and Education. The helpful comments from two anonymous reviewers and the associate editor were greatly appreciated.